p>Ground Name: The New Lawn Capacity: 5,140 (Seats 2,500) Address: Nympsfield Road,Forest Green, Nailsworth, GL6 0ET Main Telephone No: 01453-834-860 Fax No: 01453-835-291 Team Nickname: The Rovers Year Ground Opened: 2006 Pitch Size: 110 x 70 yards Home Kit Colours: Black & White Official Web Site: www.forestgreenroversfc.com About the New Lawn The ground is situated on the western edge of the picturesque Cotswold town of Nailsworth. The name Forest Green is taken from the area of the town where the clubs home is found. The ground is sited on top of a fairly steep hill and quite exposed to the elements; so warm clothing is advised when visiting. Technically the new ground does not have an official name at the moment as the Club are hoping to attract a corporate sponsor to purchase the naming rights to the stadium. In the meantime, the ground has been dubbed ‘The New Lawn’. The stadium is dominated by the smart looking Western Thermal Stand at one side of the pitch. This 2,000 all seated capacity stand, has a cantilever roof as well as row of executive boxes running across the back of it. Opposite is a small open terrace, which is only seven steps high. Running along the back of this terrace are 4 floodlight pylons. Surprisingly the team dugouts have been located at this side of the pitch, rather than where you would have expected in front of the main stand. Interestingly both ends have to different degrees been relocated from the old Lawn to the new ground. At the Nympsfield Road end of the ground, is a covered terrace, the roof of which came from the Barnfield Road side of the old ground. Opposite is the EESI Stand, which is a covered seated stand that is given to away supporters. This stand is of interest as it was the Trevor Horsley Stand which was transported from the Club’s old ground and re-erected at the New Lawn. How to get to the New Lawn If you are approaching the ground from the M5, exit at junction 13 and head for Stroud on the A419. At Stroud turn onto the A46 towards Nailsworth. This will bring you into the centre of the town, when you reach the Information Centre take the first right at the mini roundabout which goes up a hill and is sign posted Forest Green. The New Lawn is at the top of this hill. There is a small car park at the ground which costs £3 but gets full very quickly. There is street parking available within a ten minute walk. There is no railway station in Nailsworth itself. The nearest is in Stroud which is three miles away and so a taxi will be needed and cost £5. How to get a ticket for the New Lawn Apart from the FA Cup game with Derby County in January 2009, no game has been deemed as all ticket at the New Lawn. Whilst the visit of some teams (such as Oxford United) may necessitate away fans buying tickets in advance, home fans will always be able to get tickets on the door. Tickets are £13 for general ground admission and £15 for a seat in the main stand (the Western Thermal). Concessions are £8 and £10 respectively. The club claim to offer “online” bookings but I have yet to see that work. Our Last Visit – Forest Green Rovers 3 Oxford United 3 – 7th March 2009 Forest Green Rovers rank up there with the likes of Port Vale, West Ham United, Arsenal and Rushden & Diamonds as a club who play in a place that has nothing to do with their name. Port Vale play in the conurbation around Stoke-on-Trent in a town called Burslem, West Ham United play in East Ham, Arsenal as any school boy will know actually take their name from the old munitions factory south of the river at Woolwich Arsenal (the first ever franchise club) and Rushden & Diamonds now hail from the small village of Irthlingborough. And Forest Green? Well everybody knows they come from the small Gloucestershire village of Nailsworth which has a small area called Forest Green, south of Stroud. This little gem of a club bamboozle most football fans outside of the Conference (sorry, Blue Square Premier League) and very few can actually place them on a map. A few can – Derby County will know all about them as they were involved in an epic 4-3 FA Cup win this season at their neat little stadium. But I planned to demystify the mystery behind this successful little club in a welcome return to non-league football for TBIR. The Club began their life in the Hamlet of Forest Green in October 1889, founded by the local Non Conformist Church Minister. In 1894 Forest Green Rovers became founder members of the Mid Gloucestershire League (MGL). The Rovers team competed in two leagues almost every season from 1900 until 1922 and again from 1928 until 1937. They switched from the MGL when it folded in 1902, to become members of the newly formed Stroud League and also members of the Dursley and District League which they won in 1903, the Clubs first silverware. The Stroud League was won in 1912 under the name “Nailsworth and Forest Green United”, the separate Nailsworth Club having amalgamated with Rovers at the top of the hill above the town. 1926 was the year that their field was officially enclosed and given the name “The Lawn”, where Rovers played from 1889 to 2006, and in 1927 a crowd of over 5000 saw them lift the County Cup beating the Sharpness “Sharks” in nearby Dursley. The Supporters Club’s efforts after the war ensure the ground was transformed into one of the best in the west country and built their own Social Club which opened in 1968. Rovers joined the newly formed County League in 1968 and for the next 11 years moving up again to the Hellenic League in 1975. In 1982, Rovers achieved fame at Wembley winning the FA Vase 3-1 and at the same time winning the Hellenic League and moving into the Southern League Midland Division. High hopes over the forthcoming years dwindled into thoughts of what might have been and Rovers struggled throughout the 80s near the foot of the table. In a bid to turn the Club’s fortunes around Rovers were renamed Stroud FC but this proved near disastrous with many life long fans and committee members turning their back on “Stroud FC”. The arrival of Trevor Horsley in 1992 saw the Club name changed back to Forest Green Rovers and the rest, as they say, is history. Frank Gregan arrived as manager in 1994 taking the club to the Southern League Southern Division title in 1997 and into the Southern League Premier Division for the first time. The following year a showdown with Merthyr Tydfil in front of a record crowd of 2962 at the newly upgraded “Lawn” saw the Little Club on The Hill through to the Conference. Rovers were everybody’s favourites for relegation in 1999 but instead they went back to Wembley in the FA Trophy becoming the first club to appear in both the Trophy and Vase Finals, a sign of how far the club had come. The Trophy final was lost to Kingstonian 1-0, but 12th place in the league confounded the pundits. Relegation was avoided in the last five minutes of the last game the following year, but in 2001, under Nigel Spink, Rovers returned to the Trophy Final at Villa Park this time losing to Canvey Island again by the only goal of the game. A best ever finish of 9th in the Conference was achieved in 2003 under Colin Addison but this was then followed by further relegation battles up until 2006 when relegation was again avoided on the last day of the season. 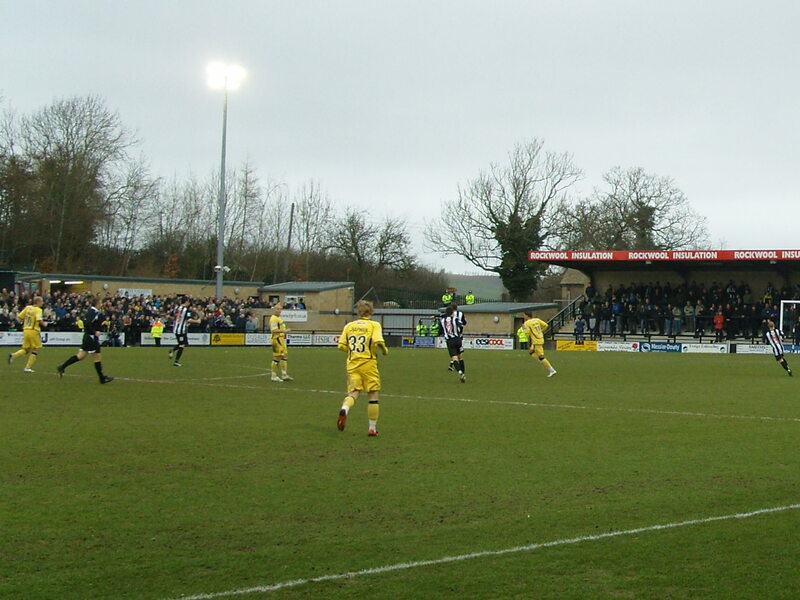 Whilst the team were struggling on the pitch, ambitious plans were put forward in 2002 to move the Club to a new Football League standard ground 400 meters away, still in the Hamlet of Forest Green. Planning permission was granted in 2005 and the new stadium was built over the next year, funded by the sale of the old ground for housing development. Carrying on a tradition set by supporters back in the 1950s the new stadium was painted from head to toe by supporters all on a voluntary basis. The New Lawn was officially opened in September 2006 which also coincided with the appointment of Jim Harvey as manger on a long term contract. Jim guided Forest Green away from the bottom of the league to a respectable mid table finish in 2007. Many Thanks to Tim Barnard for providing the above potted history. This season they have struggled to find any consistency. Excellent wins, such as the foru consecutive wins back in August against Histon, Weymouth, Crawley and Woking were then followed by a shocking run of six defeats in the next seven league games, conceding 17 goals in the process. More recently draws have been the order of the day with five in the last eight games. But games featuring Forest Green are rarely dull and recent results had seen an average of four goals per game. I had agreed that for once CMF could go away for the weekend, chosing to head off to Oxford with her chums for the weekend, leaving me with parental responsibilities, which as you know tend to revolve around a play area, McDonalds and a Premier Inn – children are amazed and amused by the smallest things. So with Forest Green at home, one of the UK’s biggest indoor play areas located close by, a Premier Inn booked next to a cinema, this was going to be a simple trip and a chance to “knock off” another one of my outstanding BSP teams. I had been in touch with Phil Sheppard via my Facebook group and he had supplied some useful advance about the New Lawn and what I could expect. The New Lawn – sounds very Bowls Club doesn’t it? The original Lawn Ground had been home to the club since the club was formed. On promotion to the Conference it was obviously that the work needed to keep the ground up to date with the ever changing requirements to host this level of football simply wasn’t worth it, so a decision was made to build a new stadium, literally a stone’s throw away. The new 5,000 capacity stadium was ready for the 2006/07 season and since then they have averaged fairly decent crowds when compared to other clubs at this level. Oxford United were the visitors for this game, effectively a local derby as they are based some fifty miles away, but with few other clubs in the region, the crowd was expected to be the biggest of the season in the league. Oxford are still seen as the big boys of the division despite failing badly to bounce back into the league last season. Under the guidance of legend Jim Smith the standard of some of the other clubs had taken they by surprise and they only finished in 9th place .In fact, the club had actually become the first club who had won a major honour (the Milk Cup in 1986) to drop out of the Football League. This season they had again failed to set the world and sat in 9th place coming into this game, sitting a few points behind the play offs. We made good time during the day after a very relaxing morning at Cirencester’s Magicworld. Having spent quite a few hours in these children’s indoor play areas 99% are basically the same and not geared up at all for adults, which is silly when you really think about it as if the parents are happy then they will stay longer and thus spend more money. This place was actually pretty good for me as it had some comfy settee’s, a decent cup of tea and more imortantly a huge TV showing the Coventry City v Chelsea early kick off game. They only have to install a bar and some Hooter’s style waitresses to have the market sewn up! Nailsworth really is a small country village – not the place you would find a football team at all. Coming down the A46, turning right at the roundabout in the village and starting to climb the very long and steep hill up to the ground. At 2pm the official car parks were full so we were routed into the “overflow” car park, complete with authentic “travellers” caravans, scrap heaps and nearby shotgun shooting. Hardly the place for the girls to be saying in their loudest south London accents that they had put “their DS’s in the bag with the SatNav in the boot”. We headed round to the entrance of the main stand where we was going to meet Phil, a member of the TBIR supporters on Facebook and was amazed to have to pay nearly £30 for the three of us. Surely the club could see that in the current day and age this is simply not a viable price. It was interesting to read the Chairman’s programme notes where he conceded that the club needed to become more attractive to new fans NOT a need to reduce the price of admission. As a comparison I managed to take the girls to the cinema and buy food for them for less than this. Clubs really need to have a reality check in the current climate, yet so few actually think of the fans – but what is new there! The stadium still has a part finished feel to it, with one end behind the goal covering just a third of the end, leaving gaps in the corners. Oxford’s support was impressive – they had almost filled the small stand behind the goal as well as the terrace along the side of the pitch. 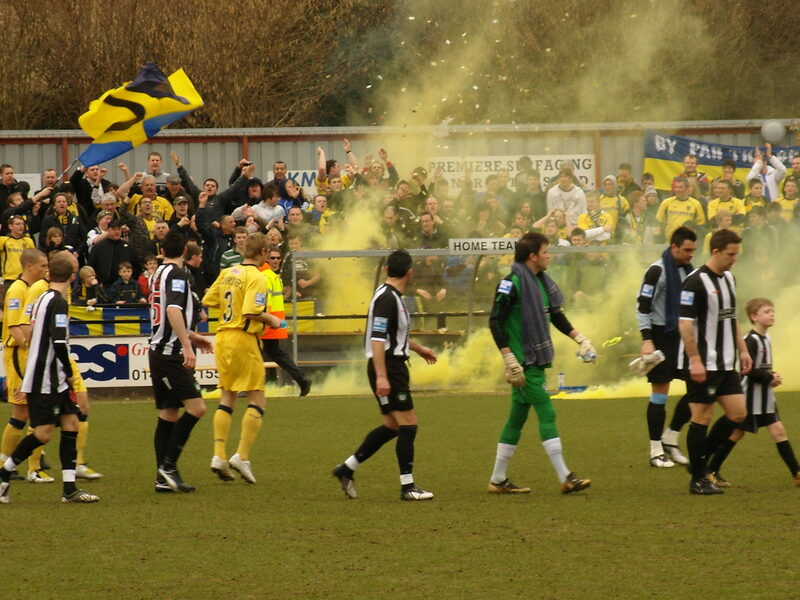 The teams emerged to an almost Italian-esque welcome complete with ticker tape and flares launched onto the pitch. This was obviously not in the plan as within minutes a dozen policemen arrived on the scene as well as two “spotters” to keep their eye on this bunch of naughty boys. The whole police presence in and around the New Lawns was very high profile indeed and apart from the flares nothing was out of the ordinary in their support during the whole game. Forest Green’s recent form suggested that they would be happy to play for a draw in this one but nothing could be further from the truth. They had obviously done their work during the week as they took every opportunity to fire shots in at Oxford’s experience keeper Billy Turley. Virtually every effort sailed close to the goal, enough to have the Oxford goalie shouting at his back four to close down the attackers. Despite their pressure it was unbelievable to see Oxford take a two goal lead thanks to two James Constable penalties in the 22nd and 26th minutes. Forest Green couldn’t argue at either decision, both given away for trips in the box caused by the incisive runs of the Oxford front two. Forest Green to their credit did not change their game plan and continued to try and find a way through from 25 yards. Just before the half hour mark Darren Jones drive from distance flew into the net to justify their shooting from distance. 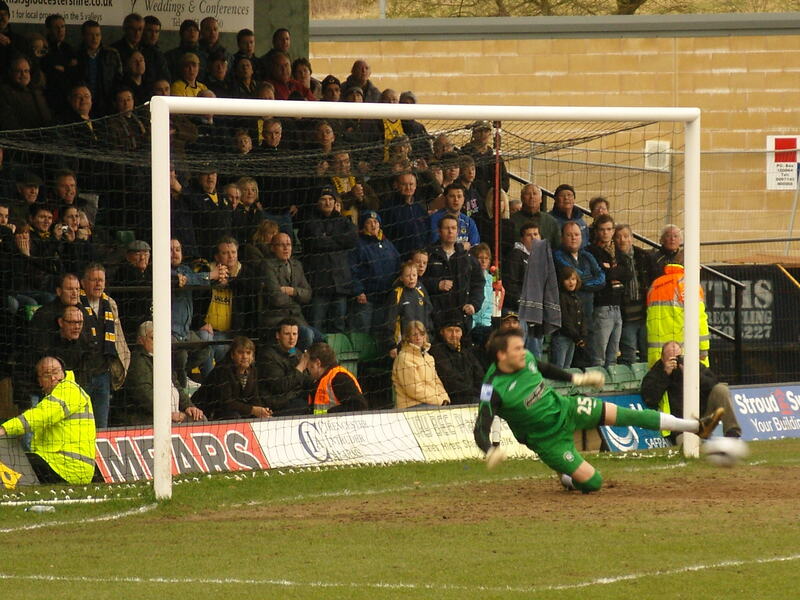 Five minutes later and it was all square as the Oxford team stopped claiming the ball had gone out for a goal kick. Forest Green’s Jones carried on, crossed and Conal Platt’s header seemed to get caught on the strong wind and bemused the keeper. Tackles flew in throughout the half and it was a surprise that the only yellow card issued was after the whistle had gone for the break for dissent by Oxford’s midfielder Hutchinson. At half time we went down into the stand and caught sight of a true legend – ex-England international wicket keeper Jack Russell who is a regular at the New Lawns and was part of the coaching team last season. Jack likes to keep himself to himself, although on the way out he did promise to take a look at the Blog, although he hadn’t yet got into this “Facebook” thing so wouldn’t be joining our group just yet. The second half was hampered by the strong wind which was certainly working to Oxford’s advantage. Chaces still fell to both teams but it seemed that both goals were charmed. That was until two superb free kicks completed the story of this excellent game. Firstly Oxford’s captain Adam Murray fired one in from nearly thirty yards which substitute keeper Ryan Robinson could hardly have seen, and one of his first touches after replacing Terry Burton just after half time. There can be no doubt of the quality of the strike and Murray deserved his plaudits. Just five minutes later Conal Platt matched the quality of Murray’s strike from twenty five yards to equalise for Forest Green from another free kick. So another draw for Forest Green, their fourth consecutive one in the league and not really the result at this point in the season. With just one league match at New Lawn in the next five and Ebbsfleet and Barrow gaining ground with their games in hand, wins are the order for the day for the club, but based on the positive way they approached this game there can be no doubt that their absence from the division would rob both the fans and the league as a whole of one of the most attacking teams in the Conference. With the clock running down we headed back to the car in order to make a quick getaway for the cinema. Both girls has enjoyed the game although Littlest’s confusion of Forest Green United and Oxford Rovers did leave a few fans around us slightly baffled. Still this was one of the best games I had seen so far in 2008/09 and one that is sure to feature in the end of season awards. Well worth a visit to any travelling fan – although do not plan on parking in the village and walking up the hill to the stadium – you will regret it! It’s not a results business is it?